Various Artists - "Butchering The Beatles: A Headbanging Tribute"
Here's a CD that I certainly didn't ever expect to see, until I saw it being talked about on an email that I received from one of the several email groups I belong to. A total of 12 Beatles classics covered by at least fifty internationally known musicians within the hard rock and heavy metal realm. Produced by Grammy award-winning studio whiz and guitarist Bob Kulick. Each song is performed by a completely different line-up, with every cut remaining truly faithful to the Beatles signature style, but at the same time appealing to all, if not most fans. This is a fun CD to listen to at virtually any given time. Being at late night, driving to work, stuck in traffic, making out, etc. 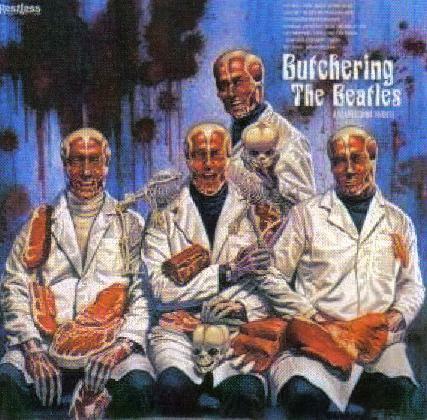 In my humble opinion Butchering The Beatles is a true keeper. Absolute best tunes are "Hey Bulldog" with Alice Cooper on vocals and Steve Vai on guitar. "Back In The USSR" with none other than Lemmy on bass and vocals and John 5 (of Marilyn Manson) on guitar. "Tomorrow Never Knows" with Billy Idol on vocals and Steve Stevens on guitar. "Magical Mystery Tour" with original Yngwie Malmsteen vocalist Jeff Scott Soto on vocals and Yngwie on guitar, Jeff Pilson (Dokken) on bass and Frankie Banali (Quiet Riot) on drums. "I Feel Fine" with John Bush (Anthrax, Armored Saint) on vocals, Stephan Carpenter (Deftones) on guitar and Mike Inez (Alice In Chains) on bass. And "I Saw Her Standing There" with one-time Motley Crue vocalist John Corabi, Phil Campbell (Motorhead) on guitar, C.C. Deville on guitar and Kenny Aronoff (Bon Jovi) on drums. You get the point. Obviously the full line-up for each and every song would be too lengthy to put in this review. Basically, if you're a Beatles fan or just a fan of even heavy rock, then you might want to land down a copy.